It's the test match of the year tomorrow at Lansdowne Road in Dublin, where number two in the world Ireland hosts number one, the New Zealand All Blacks. Kiwis have only recently come to regard Ireland as genuine competition. 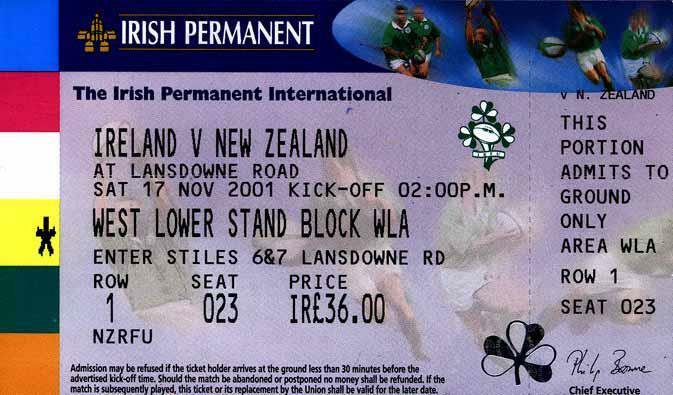 The All Blacks have been playing Ireland for 113 years and in that time Ireland have won just once, two years ago. Genuine competition they are however and as the strongest side in the northern hemisphere Ireland should provide a stern test. For a team that managed a victory over New Zealand after 111 years of trying, the Irish are supremely confident going into this one. Their players, pundits and public are predicting an Irish victory. I was living at Free Trade Wharf in Wapping and managed to get flights in and out of the City Airport, the closest of London's airports to where I lived, to spend the day in Dublin and attend the test. Friends back home in New Zealand told me to keep an eye on the All Blacks' new openside flanker, the 20 year-old Richie McCaw, who was on debut. Openside flanker is the New Zealand position as it evolved from the Kiwi innovation known as the "wing forward." It was pioneered by Dave Gallaher, the captain of the All Black Originals tour to the northern hemisphere, in 1905. Incidentally, Gallaher was born in Ireland. 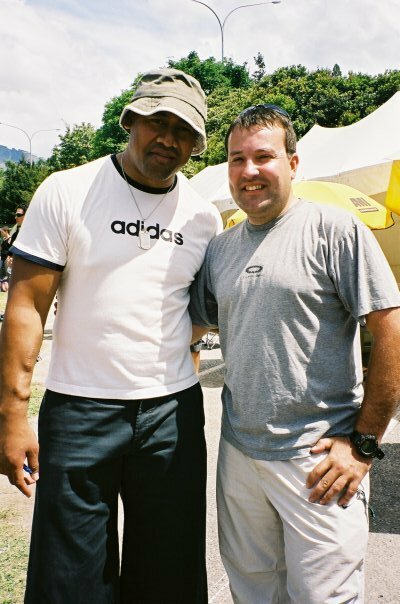 Over the century the All Blacks had been served extremely well by a procession of great openside flankers and the decade before had seen two of the best, Michael Jones and Josh Kronfeld. Who was the successor to the great Jones and Kronfeld? Where was the next All Black openside flanker going to come from? The stock of potential candidates seemed low. To be fair I was a bit hungover, as I sat in the terminal coffee shop with my face painted black and dressed entirely in black as Kiwis are wont to do for a test match, with my sunglasses on. An older couple approached me and the bloke asked "are you off to the game?" Normally this would have prompted a sarcastic response from me along the lines of "no, I'm a minstrel off to perform at a Ku Klux Klan convention" but this couple seemed nice and well, old. "Yes" I sighed, restraining myself. "I am going to the game." "This is our son Mat, he's twelve. He's going to stay with his older brother who's studying at Trinity College. He's never travelled by himself before, would you mind seeing him on and off the plane?" "Sure, happy to" I replied. 2001 was a different time. Back then you could entrust the international travel arrangements of your twelve year-old to a 30 year-old bloke in blackface you'd never met before, no worries. Mat was a nice kid. And it turned out his school rugby coach was the great All Black fullback John Gallagher whom I'd happened to meet a few months earlier at a social function at the Cafe Royal in Piccadilly. We talked rugby as we boarded and took our seats. "Good morning ladies and gentlemen" intoned the pilot. "I have some bad news. The headwinds crossing the Irish sea were greater than anticipated so we don't have enough fuel for the flight back to Dublin. Unfortunately the City airport doesn't offer refuelling facilities so we're going to have to divert to London Stansted to fuel up for the crossing." As God is my witness, I swear this is true: Mat and I took an international flight from one part of London to another. There were a lot of anxious fans on our flight and because of the delay we were under time pressure at Dublin airport. The Irish customs service and border patrol were really good about it, advising us to run and waving everyone through without checking our passports. (Incidentally this was the second time I didn't get an entry stamp for Ireland having previously entered the country on someone else's passport accidentally, but that is another story.) I handed Mat over to his brother in the terminal and headed for the ground. Along the way every Irish supporter was convinced Ireland would win. "You're going to lose," "the All Blacks are going to get thumped," yadda yadda. For a Kiwi this was extremely surprising, having never beaten us my conceit was Ireland were there merely to make up the numbers. I expected to sit in the stand and clap Ireland when they scored in the same condescending manner one claps the intellectually disabled kids at the Special Olympics, "aww, didn't they do well." And so it transpired. The All Blacks won the test 40-29 and Richie McCaw was awarded Man of the Match. He went on to captain New Zealand 110 times and become the greatest openside flanker of all time. The Irish supporters were disappointed but extremely gracious, offering congratulations on our way out of the ground and onto the Temple Bar pubs. How times have changed. Ireland are no longer the special kids, they're a genuine threat and Kiwi fans are taking this one seriously. Tomorrow morning NZ time is going to be a titanic clash of the two best rugby teams on Earth going hammer and tongs. Eighteen hours to go and I can't wait, for the first time I'm excited about a match again the Irish. Taking the 7 a.m. ferry across to Waiheke island to enjoy a breakfast banquet and watch the game at the Solar Eating House tomorrow morning feels like an intrepid journey, reminiscent of making my way to Lansdowne Road seventeen years ago. On this occassion though, I won't be applauding when Ireland score. Best wishes to both teams. The winner can rightly claim to be the best rugby side on the planet. Update 19/xi: Ireland win 16-9. National day of mourning declared in NZ. Jonah at the Queenstown Sevens. I've had a busy week. One opera, seven symphonies and one rugby international. The highlight for me was two symphonies: The first half poetry of the All Blacks in motion and Ludwig van Beethoven's 5th Symphony. But the best of it, the absolute pinnacle of my week, was 'Ode to Joy' from the final movement of the Ninth Symphony. 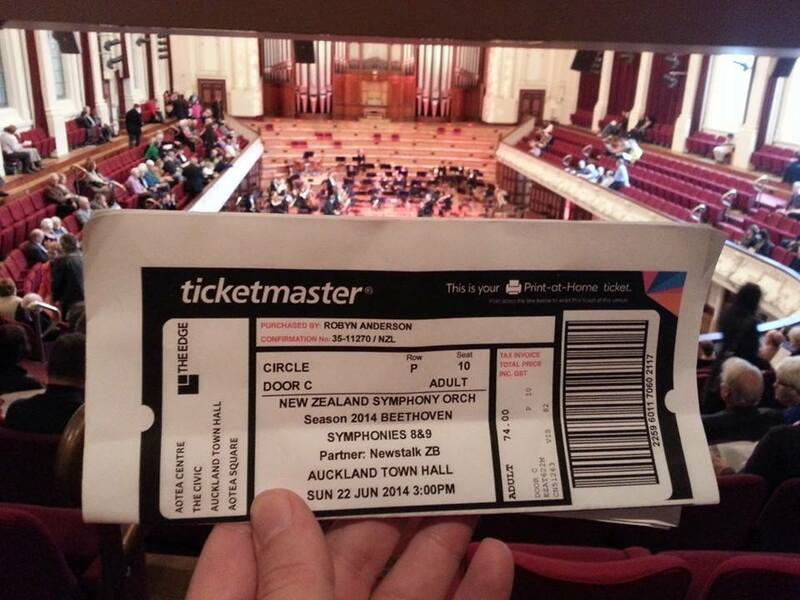 Performed by the New Zealand Symphony Orchestra, accompanied by Auckland Choral with Tiffany Speight in soprano, Annely Peebo in mezzo-soprano, Simon O'Neill in tenor and Peter Coleman-Wright in bass, and conducted by Pietari Inkinen, the magnificence of this piece was perfectly conveyed. Ludwig van didn't really do vocals. In fact no major composer did until after the Ninth. Then it became a thing. Beethoven never heard this. He was almost completely deaf when he composed it and he was stone deaf when it was performed. Here it is for your listening pleasure, one which he never enjoyed. There is magnificence in our world, and beauty within the human soul. 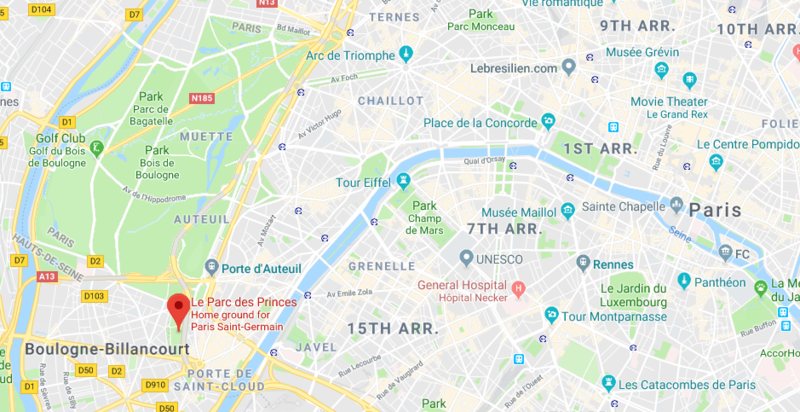 On New Year's Day in 1906 at Parc des Princes in Paris, the Republic of France took the field in their first ever international match. Their opponent for the inaugural game was New Zealand. Captaining the All Blacks that day was Dave Gallaher, killed in action eleven years later during the Passchendaele Offensive. In his memory and to commemorate New Zealand's contribution to French liberty, the winner of the first game in any year between the French and New Zealand Unions is awarded the Coupe Dave Gallaher trophy. Each year, the two Unions endeavour to hold the match on the 11th of November: Armistice Day. If the match occurs on this day, the All Blacks sew a red poppy onto the right arm of their jerseys and the two teams observe a minute's silence in memory of those who fell in two World Wars. New Zealand is pleased to welcome our French friends to the 2011 Rugby World Cup final. To remember our shared history. To continue our shared traditions.